Features components storage space with beadboard interior back and 2 adjustable shelves. The back panel of the unit is drilled for component wires at the top center. This unit can be ordered as HFS80, which includes a top hutch and the base console. 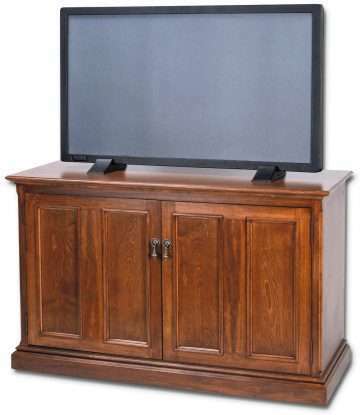 Available with a TV hutch as HFS80-Hillsboro Flat Screen TV Hutch w/Console. Ships in 2 corrugated cartons (cabinet-85 lbs, shelves-30 lbs) on 1 wooden pallet (50 lbs). Unboxed weight: Cabinet 74 lbs, shelves 20 lbs.